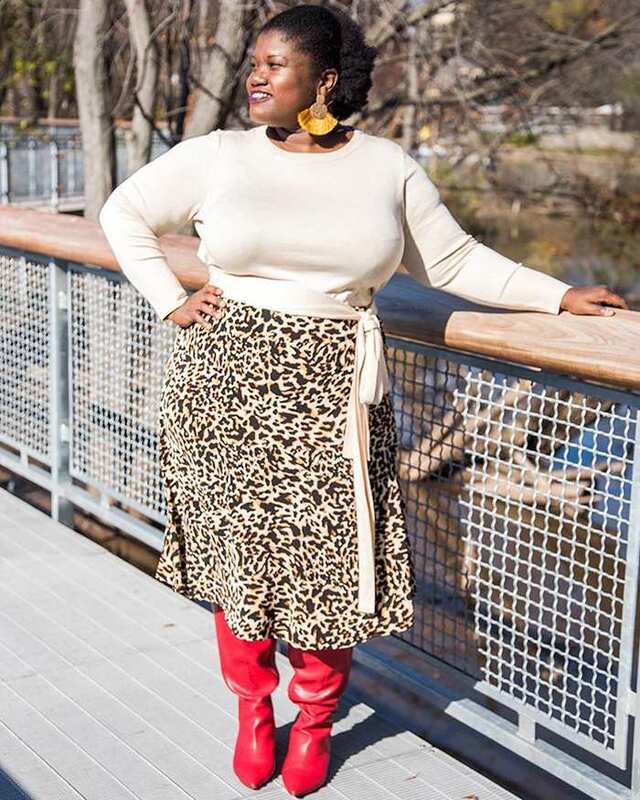 Today I would like to introduce you to Georgette Niles from Grown and Curvy Woman. 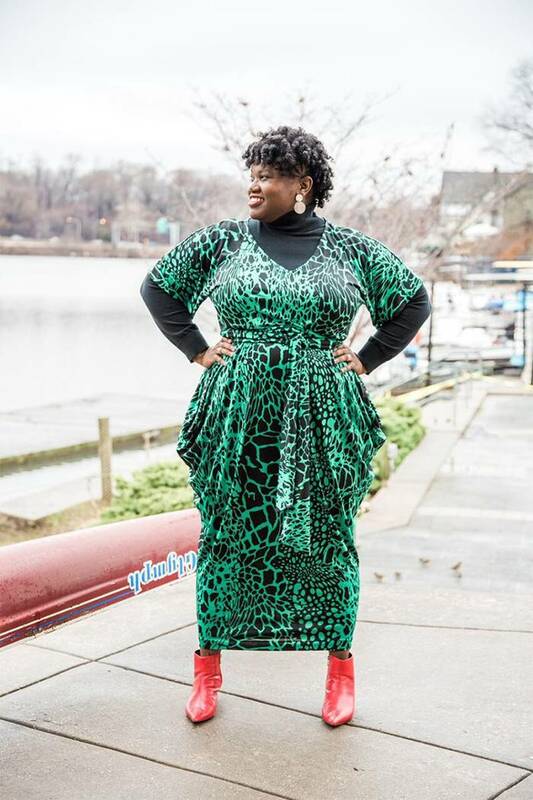 Georgette left a comment on my 40+ blogger community page and when I visited her site I was blown away with how fashionable and stylish she looked. 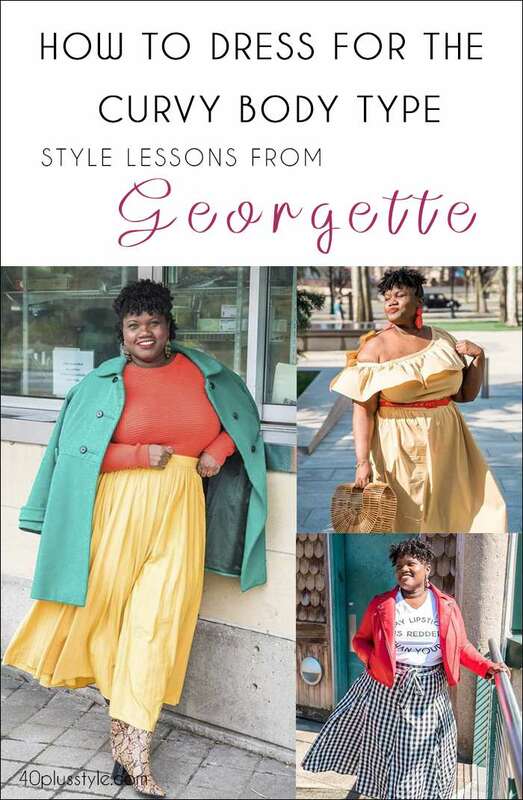 I thought she would be the perfect person to teach us once and for all that being curvy is no excuse not to look incredibly stylish and fashionable! So I decided to ask her a few questions about style and how to dress for her curvy body type. Hi Georgette. Thanks for taking the time out to answer a few questions for 40PlusStyle.com. Can you tell us a little bit more about yourself? I am an easy going individual who loves to travel and explore new things. My family and friends are very important to me. I’ve worked in the social work/mental health field for over 15 years. I turned 40 in February and couldn’t be happier! Can you tell us a bit more about your blog. Why did you start a personal style blog? There was a time when I didn’t love myself and how I dressed reflected this. I had major surgery in November 2011 and it totally changed my life. I decided to stop hating my body and embrace everything about it. The decision to start a blog was to chronicle my journey to self love and acceptance. I would say my style is “work chic”. I like to take classic pieces and mix in current trends that accentuate my body. 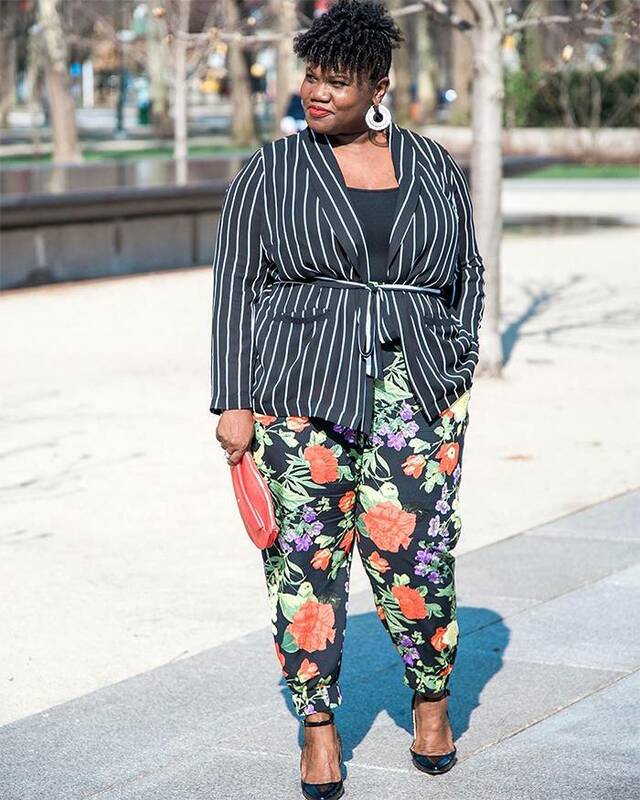 You call your blog Curvy and grown woman and you certainly show us how to dress for curves. What are the secrets to dressing for curves? Is it easy? I find it easy because I’m aware of my body type and I know what works well on me. I would say the secret to dressing for curves is to know your body type and wear clothes that accentuate your shape. Do you specifically choose clothes for your body type? What are your preferred styles? Yes I do. I have an hourglass shape so I love to flaunt my curves. I gravitate to clothing that allows me to do so, such as wrap dresses, pencil and A line skirts. Which clothes do you tend to avoid or have found not to look good on you (and possibly other curvy women)? Full skirts are not my friend…LOL. I can only speak for myself as to what doesn’t look good on me. There are too many fashion “rules” for curvy women and I don’t want to perpetuate any of them. I would say to try on clothes and see how it looks and feels on YOU. 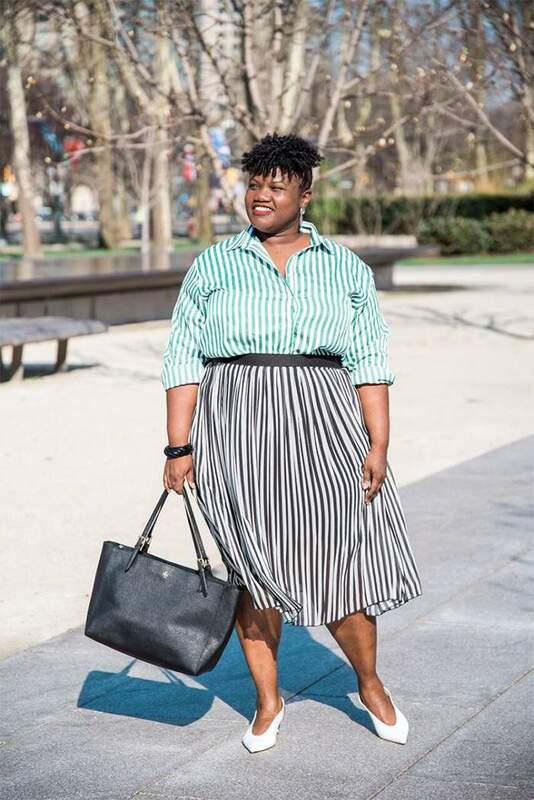 You seem to defy many of the classic ‘style rules; for curvy women like no horizontal stripes, no white pants and pull it off. What’s the secret? Cut and fit are important to me. A good structured item will go a long way. Having a tailor can be your best friend. Tailored clothes allow you the opportunity to have the best fit possible. Another thing I like about your style is that you are not afraid of colour at all and use it in many of your outfits. Have you always dressed this colourful or is it just because the popularity of colour this season? How can other women dress more colourful? In the past I never wore color because I was afraid of drawing attention to myself. Now I can’t leave the house without something colorful on! Women can add color by wearing a colorful shoe or a bright fun bag to their outfit. Has your style changed after turning 40? Yes! I’ve become more adventurous and willing to try new things fashion wise. I bought my first pair of red skinny jeans this year and wear them all the time! I’m definitely more interested in fashion and how I look. I used to wear baggy clothes to hide my curves. Now I’m making up for lost time by proudly displaying them! Because it is an expression of how much my self esteem has grown. I’m more self confident than I have ever been in my adult life. 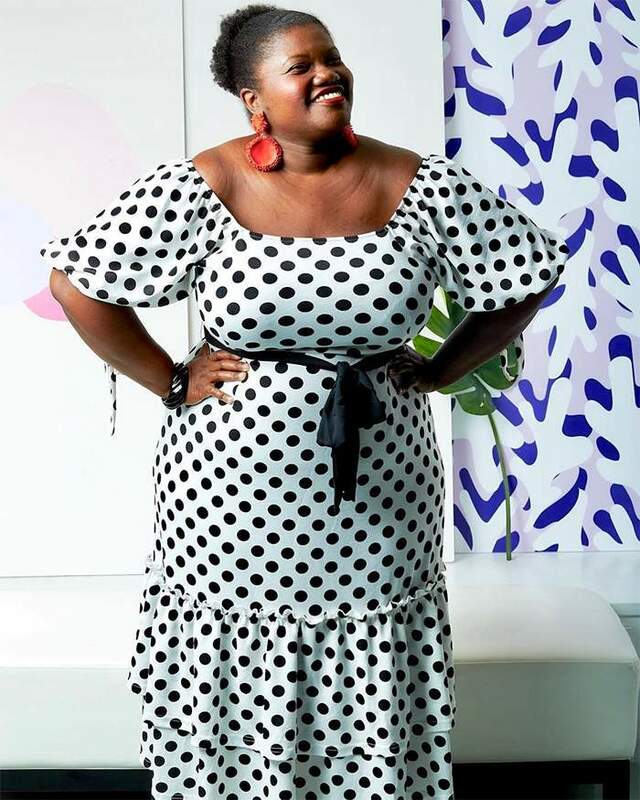 The black and white polka dot peplum dress from Dorothy Perkins I wore in my post “Have You Ever…” I love that outfit because I felt so amazingly beautiful and strong when I wore it. I follow certain trends that I think will look good on me. I love the peplum and color blocking trend. Peplum looks good on all body types and any excuse to wear more than one color is fine with me! Do you have any other fashion and style tips for women over 40? Be true to yourself but also don’t be afraid to step out of your comfort zone at times. You might pleasantly surprise yourself! I definitely plan to continue blogging. I would like to see my blog develop into a place where 40+ women can come and share ideas on a variety of subjects that pertain to our everyday life. I just want to thank you for this amazing opportunity. Honestly this has made my whole year! 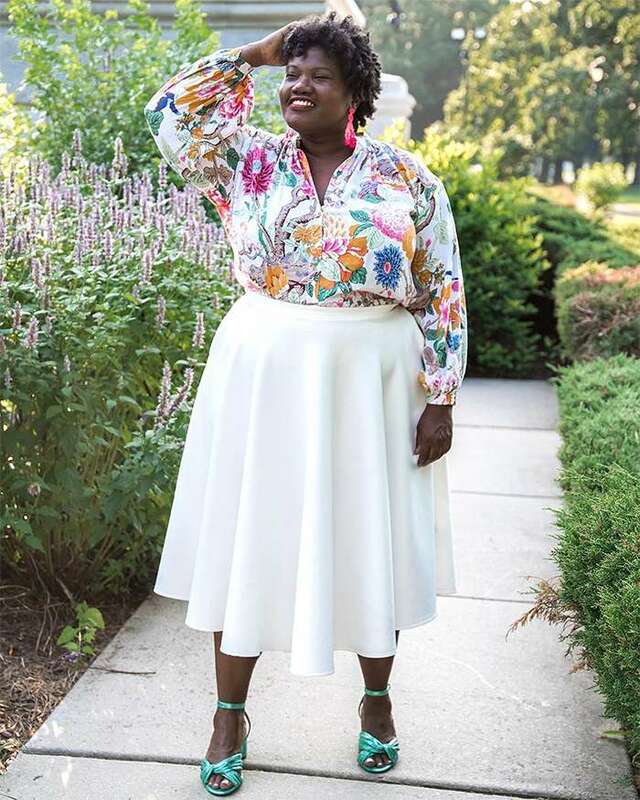 This interview proves once again that how you feel inside and how you express yourself outside go hand in hand and that many women over 40 find a new sense of self and dress better than ever before. I found Georgette’s answers very inspiring, so thank you so much for your openness and insight! 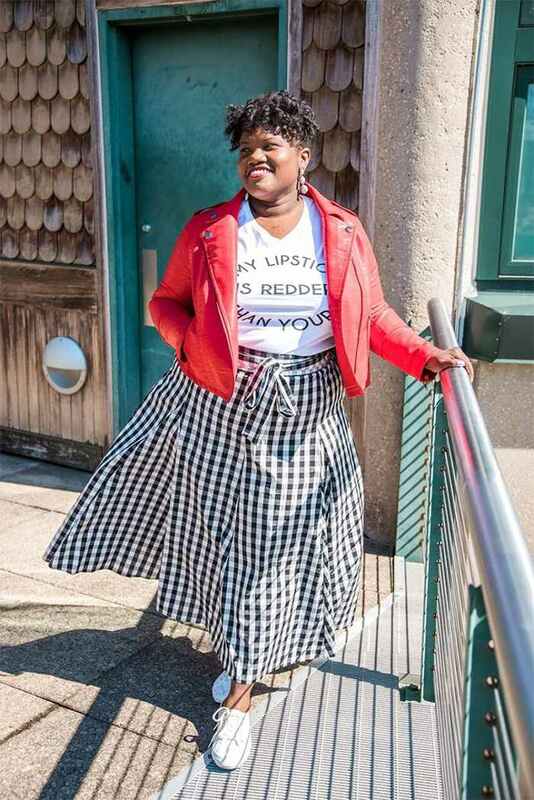 Be sure to check out her fabulous blog at Grown & Curvy woman. Thanks Anna. Glad you enjoyed the feature! 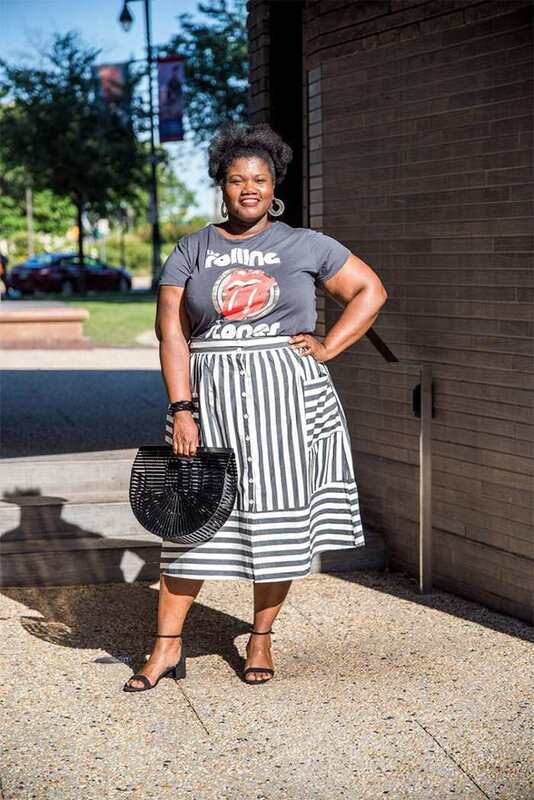 I already checked out Georgette’s blog some time ago, after finding her via 40plusstyle, and love her style. 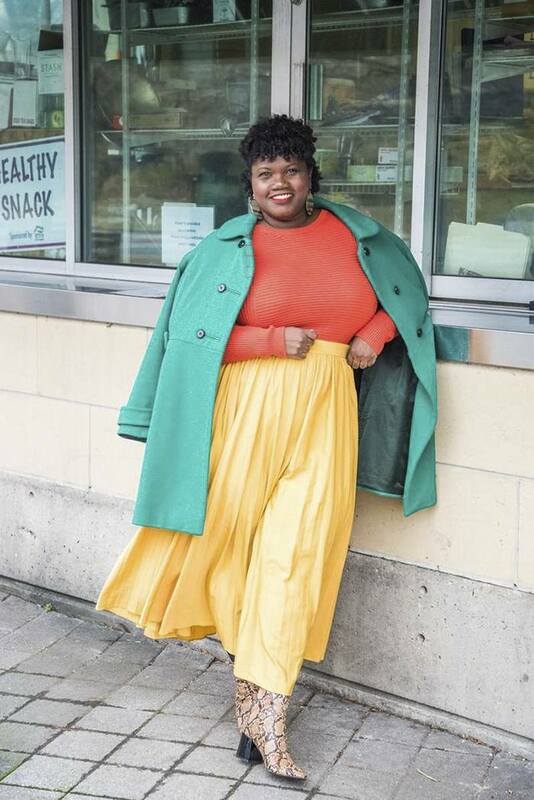 Reading in this interview that she came from not loving her body to this confident and colorful style is impressive. Congrats to you, Georgette! Very nice piece! Georgette is a class act…and as a personal friend I’m not biased at all 🙂 But really she has great style and always looks good. Thanks for sharing this! Georgette is the epitome of classy and stylish. You all know her from her blogs, but I know her personally and I am happy to see how her wonderful and beautiful personality from within has transformed to be portrayed externally. She is fly in her fashion and style as well as in life in general. You rock Georgette and you make 40 look AMAZING. LOVE the interview! This is a nice break Sylvia! 40 is the best!!! Great interview. Very inspiring . Even though we come in all shapes and sizes, we should definitely start loving ourselves from the inside, which she expresses very well. And she has a great smile too. All of her pieces are so vibrant and rich ! She really knows how to choose colors to complement her features ! Well done girlfriend ! Wow! She looks so good, and super confident too! Good on her! 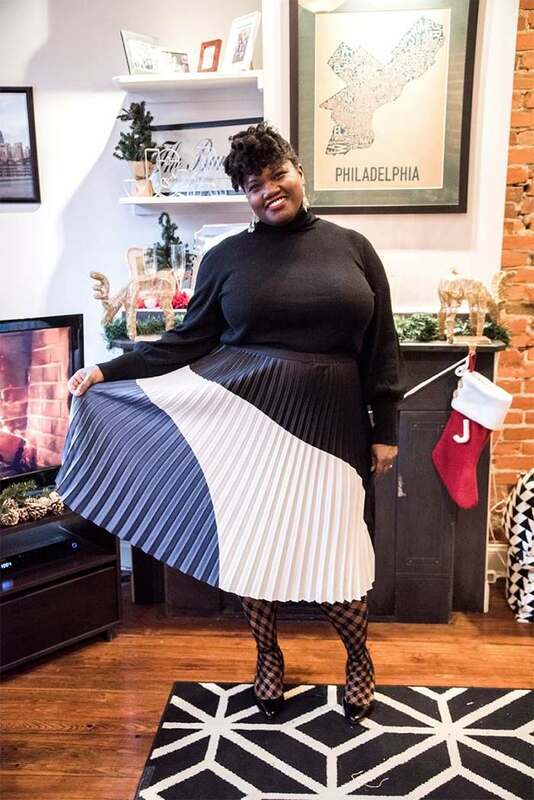 I never would have thought horizontal stripes on a fuller figure would look that good – she looks so amazing with those stripes. And she’s not trying to hide her figure either. Well done Georgette. What a nice item. Georgette looks good, fashionable and happy. A woman you want to be friends with. That is what her style tells me. My favourite outfits are the first orange one and the black and white wrap dress. They look gorgeous on her. But is is hard to choose as she looks good in all of them. I like the way she adds pops of colour. A fashion item we have been talking about for months. As far as I am concerned, the more inspiring examples, the better. Fabulos, she is soooo pretty and chic. It’s refreshing to see a woman who is truly curvy looking so smart and alluring. Often what passes for curvy or (dare I say it) plus size is not even really curvy. It’s curvy compared to the average emaciated super model. 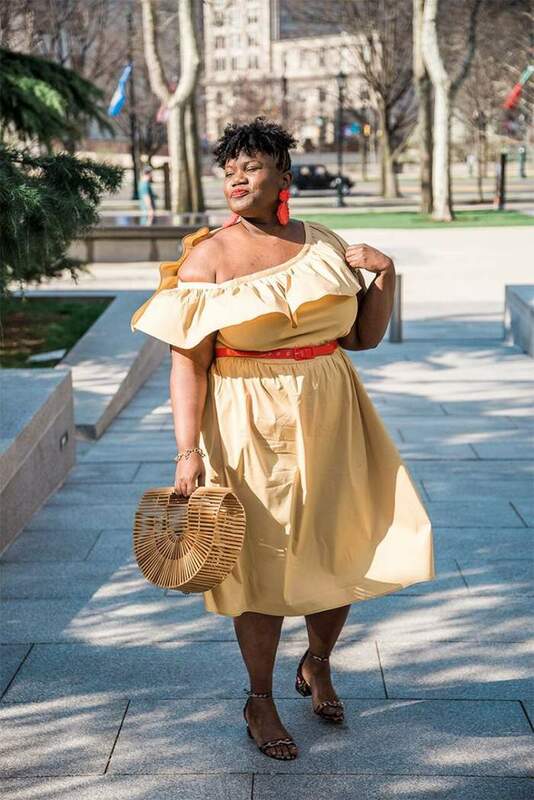 Most curvy women feature by the media are just average size everyday women and not truly curvy, which entails its own set of fashion challenges/advantages. I would loved to have seen the model in some of color-blocked peplum she spoke of. She’s got the figure for just about anything. I really like your style – particularly pictures 5 (striped dress) – 4 (yellow & green) and 6 (black/white and yellow) . but N° 5 is definitely my favourite : crisp ! Thank you Georgette for the inspirations and encouragement! You look fantastic! Such a sense of style. There’s another fantastic blogger who is ‘plus size’ – her blog is mrsallnut.blogspot.com. 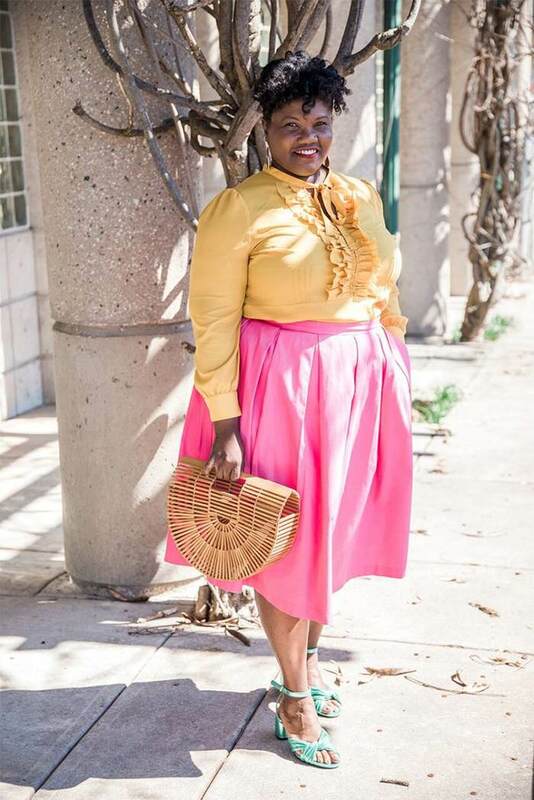 She is not afraid of colour and I love the way she puts together outfits. She’s made me look at fashion in a different light……previously I dressed head to toe in black….now I can’t go without colour in my outfit! There is no such thing as a perfect body. It wasn’t till I hit 40 that I got extra comfy with my body. Now I wear my clothes instead of my clothes wearing me. In the past I wore color to hide. Now I wear it to shine. This bloggers responses hit home for me. She articulated my true feelings. Great article! Inspiring women: Sylvia, and Georgette! My question…G, u look great!! Where do u shop??!! Lol. I never know where to”look” for clothes for my curvy physique! Thanks again, ur sophisticated beauty shows-inside and out! Get it girl!